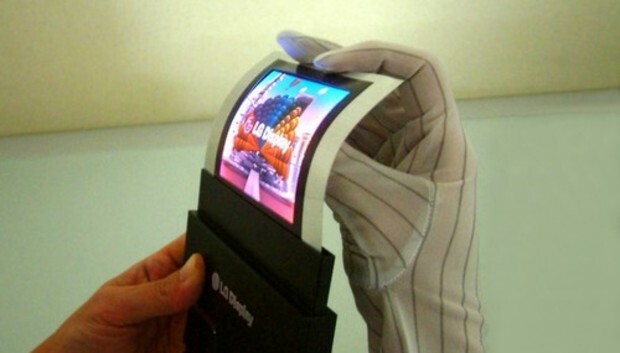 Not to be outdone by Samsung, LG says it's ready to mass produce its first flexible OLED display panel for smartphones. LG claims that its flexible panel is "vertically concave from top to bottom," curving on a 700 mm radius. In other words, it would only form a full circle if the screen was about 14.5 feet long. For a six-inch display, that translates to about 0.16 inches of concavity at the top of the arc. The panel is also among the world's slimmest and lightest, LG claims, measuring 0.44 mm thick and weighing 7.6 grams with a 6-inch panel. LG hasn't said when the mass-produced panels will start appearing in smartphones, but Reuters reports that LG will launch its own curved display smartphone in November. The phone may be known as the G Flex, and would have a 6-inch display according to CNET, but no other details are available. The strategy sounds similar to that of Samsung, which will reportedly launch a limited edition Galaxy Note with a curved display later this month. Samsung hasn't announced any mass production plans, but has been quite vocal about its goal of producing curved displays. Both companies are using plastic instead of glass in their displays. This should allow them to get to market earlier, given that flexible glass displays may still be years away. However, LG and Samsung differ in the direction of their respective curves; while LG's display flexes from top to bottom, Samsung's version curves from side-to-side, allowing the screen to bend around the edges of the phone. Aside from the cool factor of having a curved phone, the advantage of either display will be increased durability (LG uses the term "unbreakable" in its press release). Curved screens could also useful for wearable devices, such as smartwatches, giving the screen a bit of contour around the body. Exciting as that sounds, it's worth noting that LG isn't talking about prices or battery efficiency, and Reuters has noted that both cost and heat resistance have been barriers to the mass production. Although curved displays could be the next big thing for portable electronics, don't get too caught up in the hype until we've seen some actual products.